Disruptions usually make us feel uncomfortable – they’re the things that interrupt or stop the ease our everyday lives. But for 26-year-old Lara Sarkissian, who plays with the idea of interference both musically and thematically, disruptions are a source of creativity. On DISRUPTION, Sarkissian’s five-track debut EP, the Oakland-based producer blends thumping, experimental electronic beats with layers of ethereal woodwind instruments from her Armenian upbringing – with samples fleeced from YouTube tea advertisements – mixed on Ableton with her her Roland System-1 synthesizer. She describes the EP, which flew somewhat under-the-radar when it was released during end-of-year list season in late December, as an “electronic soundtrack to an imagined fictional film inspired from stories of Armenian mythology, the transition from the worship of nature to the roles of gods and goddesses, and tying these narratives to encounters with familial spirits”. Those encounters include what Sarkissian today describes as “visitations” from her deceased grandmother. “There have been multiple times in the past couple of years after my grandma passed away that I had encounters with her, and it’s been very visual,” she says. The EP is underscored by an electronic rhythmic pulse that draws from Sarkissian’s deep appreciation for club music. 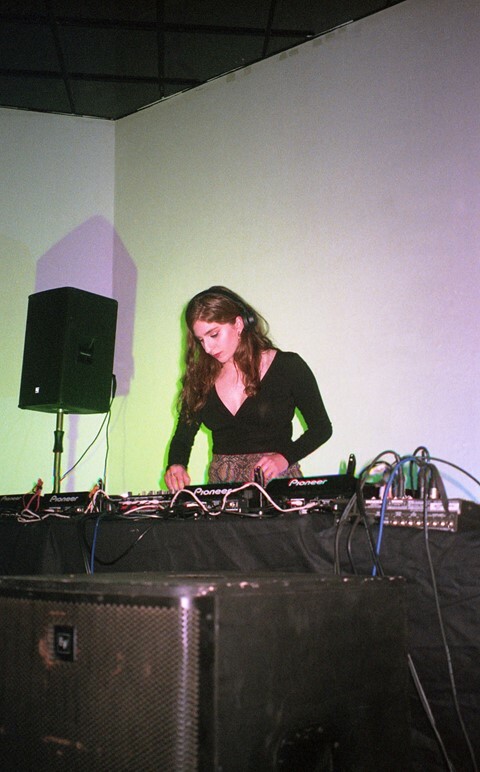 For many people involved in Oakland’s underground music community, Sarkissian is perhaps better known by her DJ alias, FOOZOOL, and as a co-founder of the party and record label Club Chai, which started in 2016 as a DIY clubnight in the city’s connecting non-western club sounds. We spoke to Sarkissian about DISRUPTION, ritualistically burning frankincense, and how her past ties into her future. How have you been shaped by your Armenian background? Lara Sarkissian: My family are actually from Iran, but we’re ethnically Armenian. I was born and raised in San Francisco and I went to an Armenian school for ten years. I grew up around Armenian music – a lot of it was folk music – in a household where my mum would always be blasting it, like in the car. I remember my first memory of music was just me listening in the car through a cassette. I remember how obsessed I was with the percussion in Iranian music, which has a lot of drums, and how much I would fixate on it as a child. I was going to ask you how music found its way into your life, but it sounds like it was interwoven with your Armenian ancestry. Lara Sarkissian: Yeah, it’s something that I didn’t expect myself to have a career in because I didn’t realise I could. It was in high school when my friends and I started a band. We were playing a lot of post-punk, a lot of garage rock, some blues covers. That was when I really fell in love with percussion. I just started listening to music really differently then. How were you listening to it differently? Lara Sarkissian: I literally just paid attention to the drum lines, the structures, the different layers. I like the different atmosphere in tracks. I think that’s what I like to create in (my music) because I come from a very visual background. It’s kind of translated into sounds for me – so making landscapes, atmospheres out of new tracks, and all the new layers out of the tracks, I always see it as this environment you’re stepping into. It’s about the distance of it all, what you can hear far away, what you can hear closer, where are voices coming from, and the movement of it all. For me I’m painting this picture like a scene – almost like a film scene. What’s the visual landscape you created in DISRUPTION? Lara Sarkissian: When I made it, I was thinking a lot about my grandmother’s story. There have been multiple times in the past couple of years after my grandma passed away that I had encounters with her, and it’s been very visual. It definitely wasn’t a hallucination. Lara Sarkissian: Not a haunting, but it was almost like I was super conscious and awake. It was a very visual picture of her and I knew what message she was sending me. It wasn’t anything that I could hear – but it was moreso a visual thing. This has happened to me before with family who have recently passed away, but I didn’t know yet. Things like that have happened to me which throw me off. That’s where DISRUPTION comes from. It comes from a disruption to your day and week, but not in a bad way. How does her passing tie into the mythological angle of DISRUPTION? Lara Sarkissian: I was reading a lot about Armenian mythology, and I came across some really interesting things: like a lot of the ancient Armenian instruments that come from the highland regions date back to almost 3,000 years. Certain percussion instruments are used in ceremonies dedicated to certain gods and goddesses. I was tying that into my grandmother’s story – thinking about her in the afterlife – and creating stories around that. Like who she encounters and what different gods and goddesses she came across. For the track “Greeted by Tir”, Tir was a god that translated a lot of dreams and passed on powers of the arts to people. I was thinking about my grandma and her love for the arts and literature, and who she must have encountered in the afterlife. Tell me about the instruments you used in the EP. Lara Sarkissian: I used a lot of different tools. I used Native Instruments’ “Discovery Series: Middle East” pack as a plug in on Ableton for some of my percussion, which allows you to have more control over it. I sampled a lot of Duduk sounds – that’s the wind instrument that’s indigenous to Armenia. It’s usually made out of apricot wood and it’s a very lyrical instrument. It almost sounds like vocals, so when you change the pitch of it, and when it’s layered all together, it sounds like different ranges of vocals coming in. I used a lot of doumbek sounds, Dhol, and then I also used my Roland System-1 synthesiser a lot. I do a lot of looping, a lot of panning of the sounds so they could sound very full. It feels like it’s coming to you from different directions. What rituals do you personally exercise to keep grounded? Lara Sarkissian: Working on music. Honestly, working on music and having access to that has been a really healing thing for me. It’s very therapeutic. So I make sure every day I spend some time on that. Also lighting incense, lighting candles in my room. The basic things like having cosy lighting. Every time I return to my room when I come home at night, I have to turn on my coloured lights in my room to make sure it’s a cosy space. We’ve talked a lot about the past. What do you have planned for the future? Lara Sarkissian: This year I started getting into spacial audio and creating these 360 sound pieces. It’s something that I want to return to next year. I want to get back into filmmaking too. I really want to shoot a really short horror film and create some experimental weird thing. I’m working with this filmmaker based in Oakland named Nadia Shihab where I’m the associate producer for her documentary film JADDOLAND. I’ll be doing a lot of work around that as well – planning screenings and community screenings, travelling to festivals, and stuff.